If you thought Puccini’s opera plots were complicated, check out his life story. Giacomo Puccini was the rightful heir to Giuseppe Verdi in terms of quality of writing and popularity. Puccini did not compose operas that told tales of sweeping, epic journeys or heroes returning from battle; he wrote about the little things, and everyday working-class people who fall in love and the relationship doesn’t go so well. These stories were set to music with powerful lyricism and a strong instinct for drama. What happened in Puccini’s private life was far more soap operatic than anything he composed for the stage. He had an affair and a child with a married woman, Elvira, whose husband, Lucca, was a womanizer. Lucca was murdered by the husband of some other woman he was cavorting with, leaving Puccini and Elvira free to marry. They did, before he continued having affairs with others. Elvira accused the maid of having an affair with Puccini, and the maid was so distraught she committed suicide. An autopsy revealed she was a virgin. Elvira was charged with slander and sentenced to five months in prison, but Puccini paid off the maid’s family and she didn’t have to serve time. This chain of events, while it hindered Puccini’s abilities to compose, definitely influenced the storyline of Turandot, an opera about Liu, a slave girl, who dies tragically by suicide. Puccini was such a national figure that when news of his death reached Rome during a run of La boheme (the story about artists starving in a garret – the pre-cursor to the musical “Rent”), the opera was abruptly halted and the orchestra played Chopin’s “Funeral March” for the stunned audience. The feeling throughout Italy was a national outpouring of grief and affection. Soprano Leona Mitchell sings the aria (the big, showy, dramatic song) “Tu che di gel sei cinta” (“You who are enclosed by ice”). The words were written by Puccini as a working title as he waiting for the librettists to get it together, and when they read the working title, pronounced it fabulous. This scene depicts Liu, before she ends her life by sword. 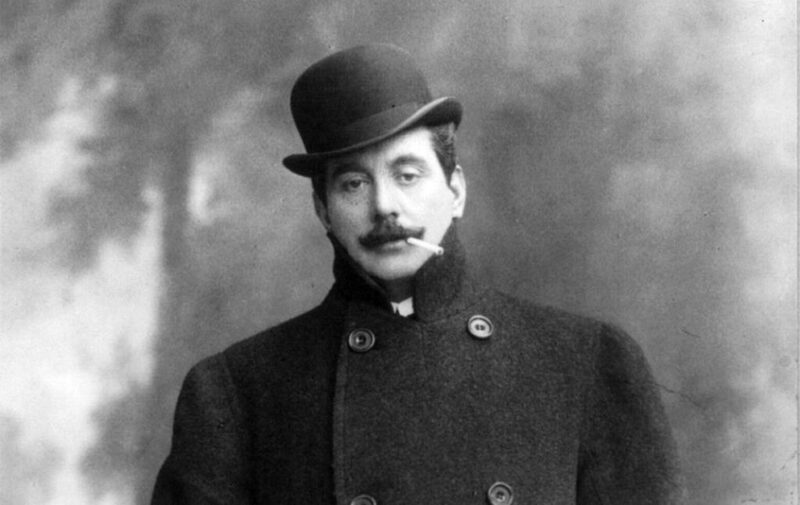 Giacomo Puccini was born December 22, 1858 in Luca, Italy, and died November 29, 1924 in Brussels, Belgium.